* Mary A. Paul - age 6, female, $100 in personal property, born in Mass., attends school. 1860 United States Federal Census, Cook County, Illinois, Population Schedule, Chicago Ward 8, Page 101, dwelling #670, family #746, Jno C. Paul household; digital image, Ancestry.com (http://www.ancestry.com : accessed 12 June 2017); citing National Archives Microfilm Publication M653, Roll 168. After John C. and Maria T. (Beamish) Paul were married in 1852 in Massachusetts, they had had three children by 1860. I have found no birth record in Massachusetts for Mary Ann Paul (age 6 in 1860) for Rebecca M. Paul (age 3 in 1860, or for Robert Paul (age 1 in 1860); the latter two who were born in Illinois, according to this 1860 U.S. Census record. 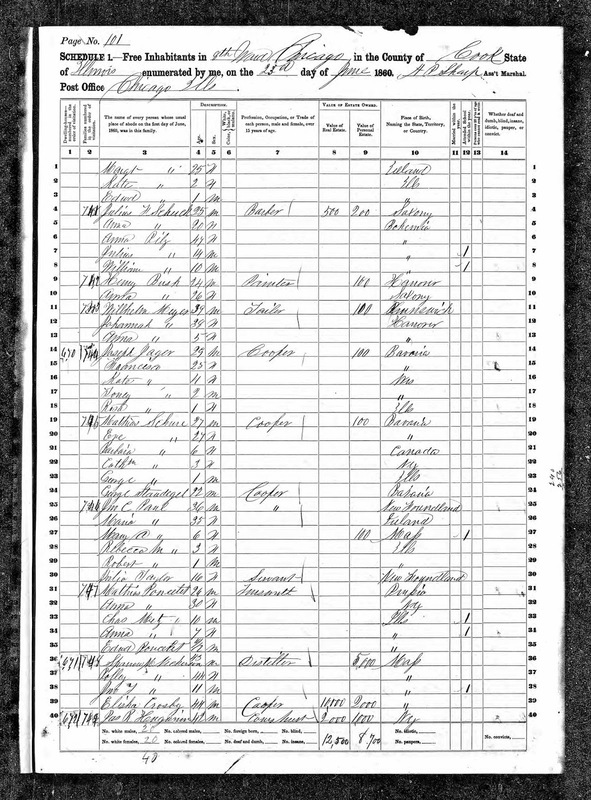 This census record narrows the approximate time frame that this family moved from Massachusetts to Illinois - between 1854 and 1857. There is an interesting entry for the daughter, Mary A. Paul. She has $100 in personal property. Perhaps she received this from her parents. I have no information about her parents other than their names from the 1852 marriage record in Massachusetts.